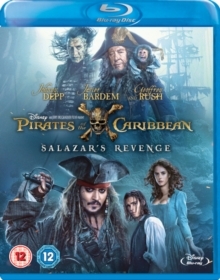 The fifth film in the swashbuckling adventure series in which Johnny Depp reprises his role as Captain Jack Sparrow. After escaping from the dark and mysterious waters of the Devil's Triangle, merciless ghost pirate Capitán Salazar (Javier Bardem) leads his crew of undead warriors on a mission to find the much sought-after Trident of Poseidon. The cast also includes Geoffrey Rush, Brenton Thwaites, Orlando Bloom and Kevin McNally.